We’ve developed a plan for Punchbowl that enhances the local character, improves the shopping hub, allows for new homes and better access to transport. Have your say. The Sydenham to Bankstown Corridor Strategy provides a planned approach to growth, with infrastructure delivery and development co-ordinated along the corridor. The Strategy plans for new homes and jobs over the next 20 years and builds on the Sydney Metro City and Southwest project. There are 11 station precincts within the corridor. They are already great places to live, and each has its own unique qualities. This Strategy will enhance the precincts by: valuing neighbourhood character, renewing town centres, providing improved open spaces and community services and facilities. Exhibition on the revised draft Strategy closed on 3 September. We are now considering the community submissions and working on the Final Strategy. Thank you to everyone who provided feedback. A centre that is better connected to its well-loved cosmopolitan shopping strip with great places to shop, eat and socialise – day and night. Retain architecture along Punchbowl Road, The Boulevarde and Breust Place that contributes to the character of the area and ensure that new development responds appropriately. The potential for a new linear park along the metro line and new access to school grounds could create new and interesting places for leisure and recreation. A range of new homes to suit different households and complement the existing character of Punchbowl. This map shows the key changes that have been made to the Punchbowl Station Precinct Plan as a result of your feedback. Design of GreenWay South West The Department of Planning and Environment (DP&E) is preparing a concept landscape master plan for a shared pedestrian and cycle link and linear park should surplus rail land become available. Public Domain and Station Access Plan Sydney Metro will prepare a Public Domain and Station Access Plan for improved station design, accessibility and interchange with other modes of transport. The new metro station at Punchbowl will provide improved pedestrian and bicycle access. Finalisation of the Strategy and Local Planning Direction DP&E will finalise the Strategy including a local planning direction (a Section 117 Direction) to guide future development. Special Infrastructure Contribution DP&E is preparing a draft Special Infrastructure Contribution plan (SIC) to identify the regional infrastructure improvements required to support growth in the Corridor. The SIC levy will fund a range of community, transport and open space infrastructure. Planning for Schools The Department of Education will identify locations for new or expanded schools within the corridor based on the growth proposed in the Strategy. Precinct Support Scheme Funding DP&E will provide funding to Councils through the Precinct Support Scheme to improve amenity and infrastructure within the Corridor. We will use community feedback to produce the final Strategy. Once finalised, we will continue to work with stakeholders to deliver the Strategy and plans over the coming years. Click here to see the timeline on the summary page. Improved north-south transport and pedestrian connections are important. Traffic congestion and parking needs to be addressed particularly along The Boulevard, Punchbowl Road and Georges River Road. New retail, streetscape improvements and night life should complement existing shops. New housing needs to take into consideration varying family sizes. Improved cycleways and open space (pocket parks) are important. Good design of new apartment development is important. 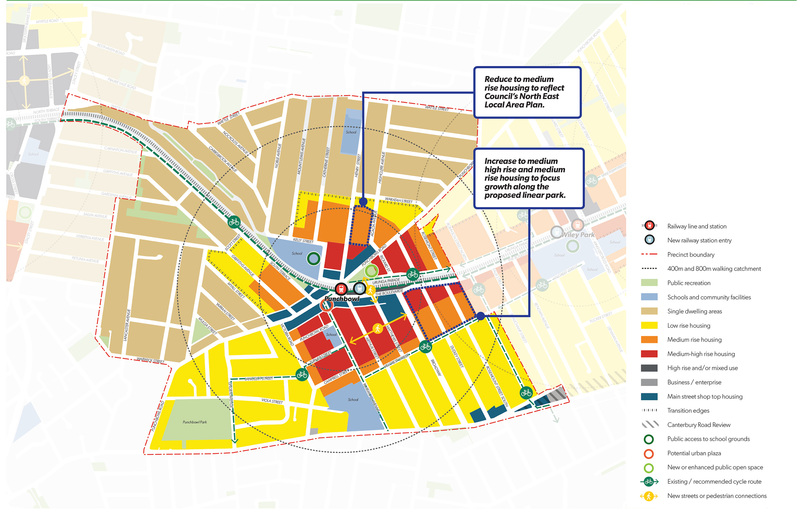 More detailed information on the feedback can be found in the Punchbowl Station Precinct Plan.